The skies had turned a dismal grey, and the sight of raindrops splattering on the windows was our only view as the bus navigated the steep winding road. We were the only ones remaining on the bus from Greymouth to Fox Glacier, the rest had disembarked at Franz Josef Glacier, decidedly the more popular of the two glaciers in Westland Tai Poutini National Park. “It’s only a few more minutes, guys. I know you’re tired and can’t wait to get there. Neither can I, actually”, our driver said sympathetically. It had been a long bus ride and the gloomy skies didn’t help with lifting our spirits. An hour later, sitting in the comfortable warmth of the heater, we excitedly made plans for our first day, the highlight of which was undoubtedly going to be the Glacier Walk. Neither of us had experienced anything like it before and the idea of a guided walk on Fox Glacier sounded just like the kind of adventure we wanted to experience in Glacier Country. Then we headed into the center of the village for a relaxed dinner at the very ‘Western’ Cook Saddle Café and Saloon. Fox Glacier Village was exactly as we had expected, a tiny village with a few lodges, B&Bs and a couple of restaurants. We hadn’t come here looking for nightlife or expecting the usual comforts of tourist centers. This was precisely why we’d chosen to come to Fox Glacier instead of Franz Josef, because we didn’t want to compete with large crowds when it came to booking activities or hiking in the area. It had been a great decision; we saw very few fellow tourists and even had an entire trail almost all to ourselves! Don’t get me wrong, I’m a tourist and I don’t mind other tourists but sometimes when a place is overcrowded, it doesn’t get the admiration it deserves, simply because it’s hard to enjoy it as much. If you’re planning a trip to Glacier Country and wondering which of the two glaciers you’d like to see more, or where to base yourself, here’s a list of things you can do in Fox Glacier Village. Personally, not everything went as I planned but I still loved this part of our trip and would highly recommend it. The next morning, we woke up to find that our glacier walk had been cancelled due to strong winds. Unfortunately, this continued to happen over the next two days and so ultimately we could not experience what we had most been looking forward to. Well, one of the important lessons travel teaches you is that not everything will go as planned and you must take it in your stride. The Fox Glacier Guided Walk is undoubtedly the highlight of any trip to the glacier and a once-in-a-lifetime experience. 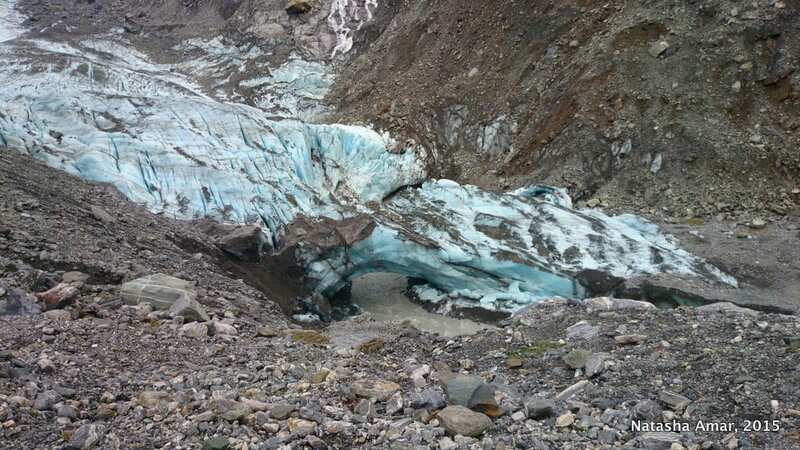 We had booked the Fox Trot Half Day Guided Glacier Walk because it’s suitable for beginners who don’t have prior experience with crampons or trekking on ice. There are other options such as the Flying Fox Heli Hike, which flies you into a remote part of the glacier by helicopter, and the Fox Ice Climbing Adventure, suitable for those with high fitness levels and completely worth it if you’re not on a strict budget like we were. More information is available at the Glacier Country NZ website. The tours available at any time are highly dependent on weather conditions so plan for an extra day or two in Fox Village, in case a guided hike, heli hike or ice climb is something you absolutely must do before you leave. This was our next best option to get as close to the glacier as possible. 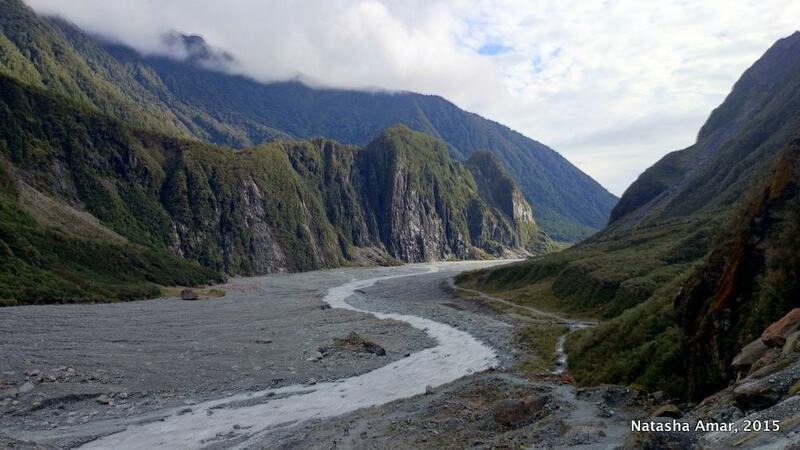 While there is a guided option available, the Fox Glacier Valley Hike (2.6km return) is something you can definitely do on your own and suitable for basic fitness levels and children. You can drive all the way from the village to the car park, about 3.5kms away, after which you begin the hike. The easy hike to reach the terminal face takes about 45 minutes and there’s just one trail that’s well marked. Hazardous areas are roped off; rock fall, icefall and unexpected surges in glacial streams are common. The trail on the floor of the river valley is rocky and damp at certain points from the streams. At the end of the hike, the snout of the glacier with the Fox River flowing beneath is a rewarding sight. For me, this was the highlight of our time in Fox Glacier Village. 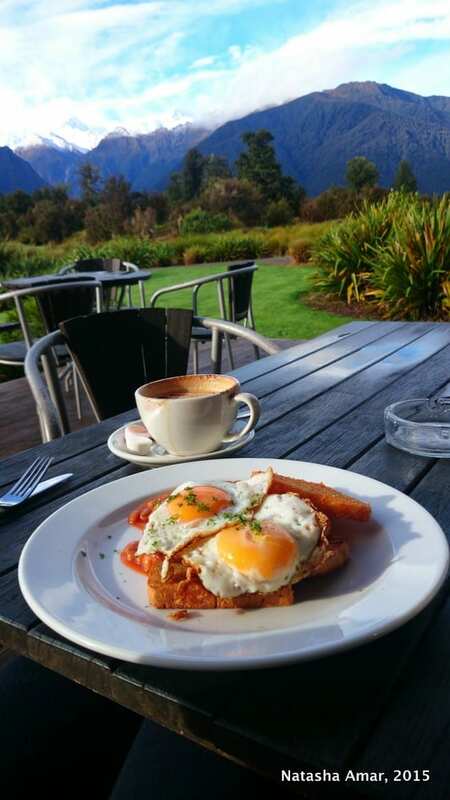 Like we did, begin your day with a lovely breakfast and a view that’s hard to beat at the Matheson Café. 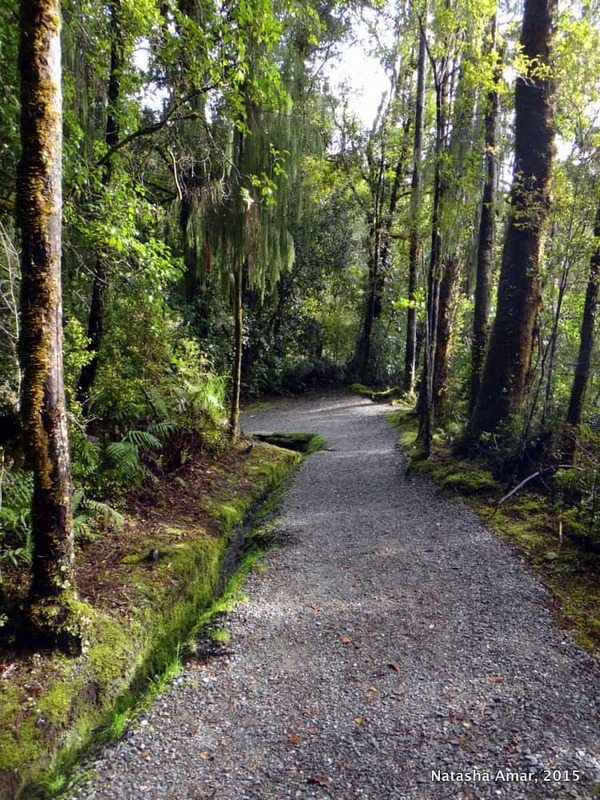 Then, hike the Lake circuit, a 2.6 km easy hike around Lake Matheson, through native rainforest, that takes about an hour and a half. The waters of the lake perfectly reflect the country’s highest peaks, Mt. Cook and Mt. 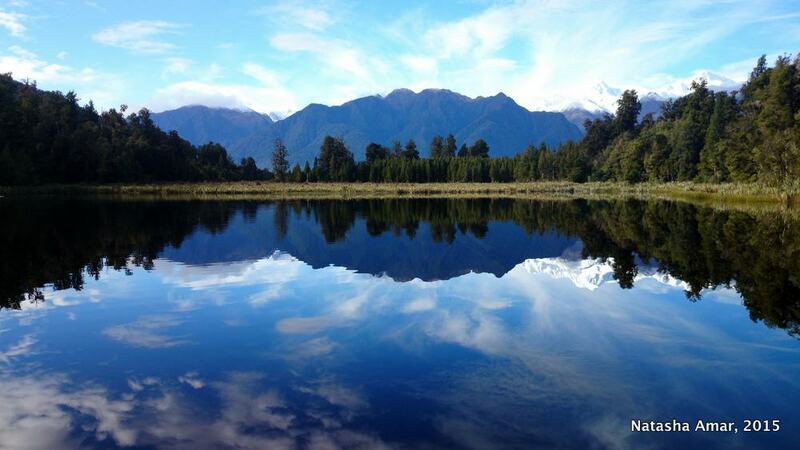 Tasman creating a stunningly beautiful mirror image. To get your postcard shot, try to get there as early in the morning as possible when the water of the lake is still calm and without any ripples. The lake is home to long finned eels and many water birds. Waterproof hiking shoes are recommended, as the trail is damp in parts. The accommodation in Fox Village is not a whole lot to choose from; there are lodges and some really nice B&Bs, but nothing too fancy. 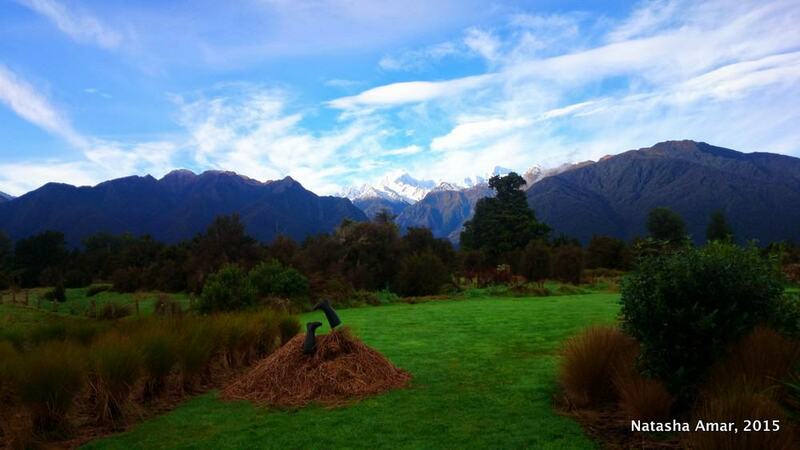 When we booked, we found the accommodation here to be cheaper than Franz Josef Glacier. Our B&B hosts were nice enough to lend us their car for free to drive to the village center when it was too cold to walk there. Book your hotel or B&B in Fox Glacier village or consider one of these options. There are about 7-8 restaurants in the village and most of them are concentrated in the center, so don’t expect a wide range of dining options as you would in a city or big town. Here are the restaurants in Fox Glacier. Book your transfer to Fox Glacier or Franz Josef Glacier. Check out my itinerary for two weeks in New Zealand. 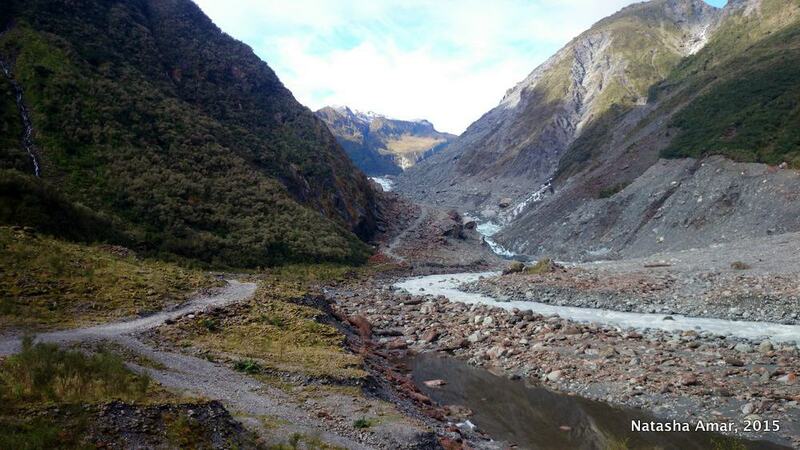 For more information and practical travel info, check the official Fox Glacier website. Keep an eye on the weather and keep a few extra days so that you can still do everything you want to even if you have a day or two of bad weather. 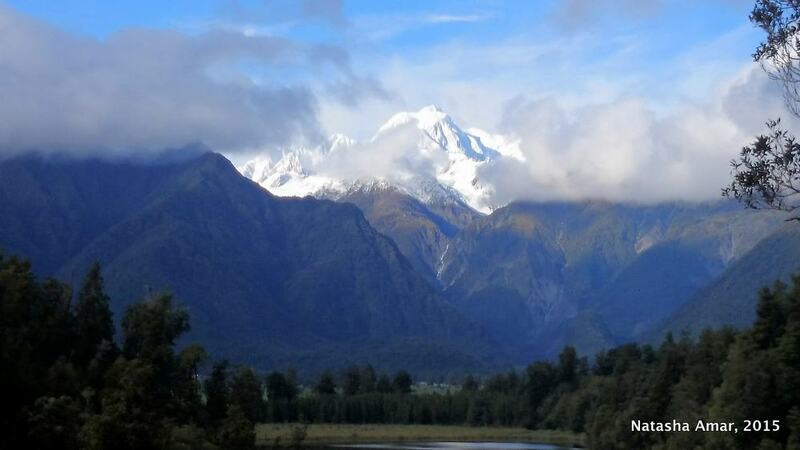 Have you visited Fox or Franz Josef Glacier in New Zealand? How was the experience? If you’ve never visited, does this sound like a place you’d like to explore? I loved fox Glacier. I visited in winter and we were lucky enough to do the helihike on the glacier.. . I also spontaneously did a bungee jump there which was terrifying and thrilling! I wish I hadn’t been so scared and enjoyed the view more! 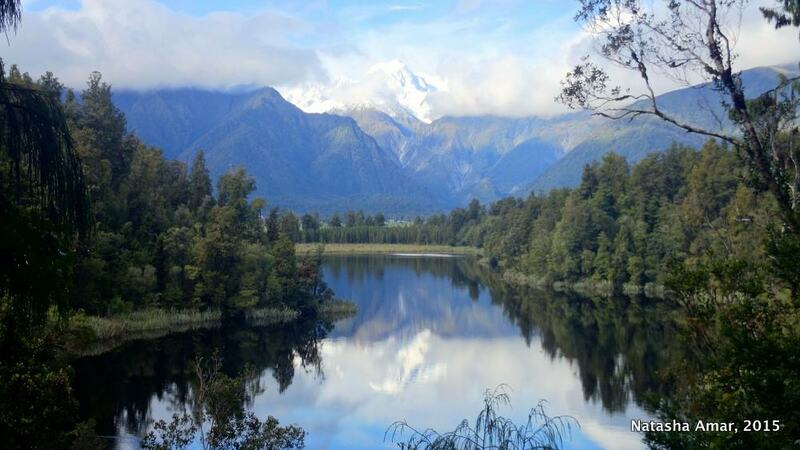 I loved lake Matheson too! Awesome post, Natasha! I’ve been reading through your New Zealand section and you really have great content! I particularly enjoyed this one because it made me think back on my Fox and Franz Josef glacier experience. I actually did the helicopter flight over them and set foot on the glacier itself! What a humbling experience to stand on this vast river of ice. That sounds amazing Mark! I finally got to hike on a glacier in Iceland and you’re right it was humbling. It was one of those moments where I felt truly grateful to be alive to experience it. Thank you for reading! I had no idea glacier walks were a thing in New Zealand! Sorry you missed the guided glacier walk, but looks like the hike was a nice alternative. Your pictures are stunning!! Definitely adding this to my running list of “gotta-dos” in NZ!! I’m not much a hiker but this looks so beautiful! I completely get you on choosing the least touristy option to get a better opportunity to appreciate natural beauty! Gorgeous views! I think I would take your advice and go with a guide – always a good choice! This is definitely a place we’d want to explore!! You’re right – what a postcard photo of the mirror image of Mt. Cook and Mt. Tasman!! Amazing! Oh man! There are so many things I want to see and do. The landscape from the photos looked similar to a trek I just did! Great photos as always. This is actually the first time that I have heard of this place and… it looks AMAZING. Will definitely be taking note of this! It’s NZ after all- everywhere in the country is amazing! Sorry you missed out on the glacier walk. 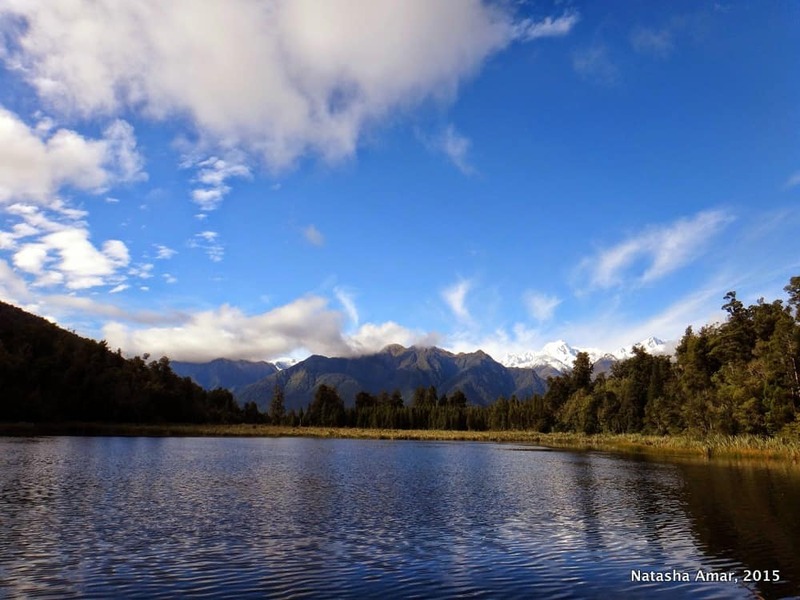 Now you have and excuse to visit again 🙂 Lake Matheson looks stunning and I think my kids would love to explore there. You’re photos alone sold me the place. This is so nice. Thanks for sharing about it. I can’t imagine how many nice places there are in this world. It seems like I will never be able to explore them all. Natasha, thanks for helping me to relive my own memories of the South Island. I stayed in both Franz Josef and Fox Townships, so I could spend a full day walking to both glaciers from their respective townships. I had hesitated about (the cost of) taking an overhead flight, but I’m very glad I did, because the flyover went over both glaciers and we did a “drive by” Mt. Cook. An enduring memory is squeezing a few hours at Lake Matheson and recording “the sounds of a sunset” with the last light on Mounts Cook and Tasman. Definitely want to go back and spend another few weeks on the South Island! Same here Henry, I’d love to go back so I can get closer to the glaciers and explore other parts of the South Island that I missed the first time. Too bad you missed out on the glacier walk. I think I would have been bummed out too. What you did see is so gorgeous, especially the lake! Stunning reflection. It was beautiful, but I’m hoping to go back to do the glacier walk someday. Hi there, great post and I also went to the Fox as a child. Brings back memories. I stayed in Fox Glacier many years ago on a family holiday. Your photos are exactly how I remember it! Our family did the guided Glacier Walk and it was incredible. Even though I was quite young at the time, I can vividly remember the detail of it. That shot of the reflection is crazy amazing good! Stick that in a a photo frame! Thanks for linking up with #SundayTraveler.